Download this FREE PDF full of Sudoku Puzzles. 200 Sudoku Puzzles: For Boosting your Brain-power! is a PDF book containing 200 printable Sudoku Puzzles. You can download this book for free for your own personal usage. 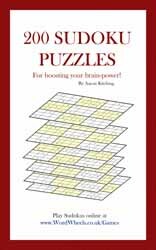 Sudokus are an excellent brain trainer so teachers can download this book and print out the pages for students to complete in class or for homework. You don't have to printout all of the pages at once if you feel the number of pages is overwhelming, simply just print out a selected few pages and save the rest for another day. Feel free to distribute this book to your friends or other teachers, but please don't sell or publish the book elsewhere. Why buy a book when you can download one for free! Sudoku has been proven to be one of the best ways to improve brain activity, particularly in children. They are a superb brain exercise and they improve IQ and logical thinking. It has been noted in the past by scientists that Sudokus have such a high educational value that they are highly recommended for children. They are not only a fun game to play but they force you to think more logically. They are said to improve concentration levels and all-round brain power. Children that have little interest in studying and low concentration levels often enjoy Sudoku puzzles - playing Sudoku puzzles helps to reverse this problem. There are many more educational benefits that can be gained from this free Sudoku book. Sudoku puzzles are said to improve memory, patience, confidence, left and right-side brain skills, and they can help in making you a better decision maker. All skills that teachers should teach children. This printable Sudoku puzzles PDF book contains 200 puzzles with two puzzles on each page. All the pages can be printed out on A4 paper, or if you prefer print just a selection of pages and save the rest for later. The book is by the author of this website, Aaron Kitching, a professional Website Developer from Manchester, England. You don't need to register, login or provide your email to download the book. Just click on the Download link below. If you cannot find the book after downloading it, please check in your Downloads folder on your computer and look for a file called WordWheels_FreeSudokuBook.pdf. If you would like to read some more about Sudoku Puzzles, then check out this page. If you enjoy playing Sudokus online, please try our Sudoku game on this website. Click here to play now. If you enjoy playing puzzle games in general, click here to check out our games menu.